One of my all-time favorite Seinfeld episodes featured the dentist character Tim Watley, played by Bryan Cranston. Watley begins making Jewish jokes after a recent conversion to Judaism. Seinfeld discovers this, is clearly bothered by it, and in response, visits one of Watley’s fellow patients, Father Curtis (sitting in a confessional booth to do so). After Seinfeld shares with Father Curtis the humorous antics of Watley, Father Curtis asks Seinfeld, “And this offends you as a Jew?” And Seinfeld responds, “No, it offends me as a comedian.” As one who was raised Jewish myself, complete with Bat Mitzvah, years of Hebrew school and the requisite trip to Israel, I always secretly revered that statement, however silly it may be. I might go so far as to say I found it admirable and noble; all hail in the name of laughter! I readily identified with the notion that Seinfeld ultimately held his identity as a comedian closer to his heart than that of his ethnic and cultural heritage. The opportunity came to test my commitment to comedy above all, however, when I recently co-directed (with Ms. Gina Sandi-Diaz) a play titled The Last Cyclist. The Last Cyclist, written by Karel Svenk, is a comedy borne out of the Holocaust; specifically, written and rehearsed inside Theresienstadt, one of many concentration camps in operation roughly from 1940 – 1945 during WWII. What sort of authorial voice do we have in Karel Svenk, who in the midst of starvation, degradation, torture and dehumanization, found the energy and inspiration to write a comedy? What might he have to laugh about in his given circumstances? And, beyond all this – how did I approach directing such a piece nearly seventy years later after its initial conception? Karel Svenk, the man who found the motivation and enthusiasm for laughter despite everything, was a Czech prisoner. What little we know of Svenk – a comedian, actor, and playwright – was that he was charismatic, funny, goofy in the best of ways, and inspiring to his fellow prisoners. Naomi Patz, who has reconstructed and reimagined his work (the script adaptation of The Last Cyclist which I directed in the theatre), has often stated in her discussions of Svenk that he was something akin to a European Charlie Chaplin, in terms of his physical comedy. Were he to be alive today, she says, we might read him as analogous to a Robin Williams: someone whose manic energy was infectious, and could somehow shine light in even the darkest of corners. Svenk was someone who could readily demonstrate for us the value of comedy as a tool for overcoming the worst cruelties of life, in the skillful manner of a true artist and comedian. Happy Birthday, Samuel Langhorne Clemens. Not you, Mark Twain. November 30, 2015 will be celebrated as the 180th birthday of one Mark Twain—novelist, humorist, and all around American celebrity. I, for one, will not be celebrating. That means that this February 3, 1863 will be Mark Twain’s 153rd birthday, which is not that fancy of a number, but it is getting up there for someone still so famous as to have people writing books about him—and more importantly, people reading books by him. Sure, everyone knows that “Mark Twain” was really the pseudonym of Samuel Langhorne Clemens. Even early in his career, almost everyone knew that, often using the names interchangeably, as most Americans still do. Not as many people know the names Samuel Clemens used an abandoned before creating Mark Twain: “Grumbler,” “Rambler,” “Saverton,” “W. Epaminondas Adrastus Blab,” “Sergeant Fathom,” “Quintus Curtis Snodgrass,” “Thomas Jefferson Snodgrass,” and “Josh.” Selecting “Mark Twain” was clearly a wise choice, although the name would have had a second, nautical meaning for many nineteenth century folk. Samuel Clemens mixed up the use of his given name and his chosen name—making the whole distinction a mush of confusion that is either a bonanza of psychological material or, alternately, meaningless. For most people, I would guess the distinction is meaningless trivia, which is fine. I’m just happy people still know and read books by Mark Twain. But, I for one, will still grumble when people wish Mark Twain a “Happy Birthday” each November 30th, and I will still try to correct them by pointing out that the “Mark Twain” they refer to really was born—or created—on February 3rd, 1863. After a long winter, April and the promise of sunshine and warmth made us almost giddy as we filed into the auditorium. During her reading, students seemed a bit more . . . aware; faculty seemed a bit more . . . cheerful. 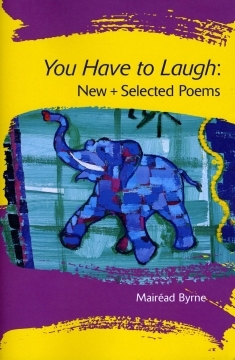 We had endured 31 of the darkest days on record, and now Mairéad Byrne, our April, was reading from her collection You Have to Laugh: New + Selected Poems (2013), a compilation of witty and clever musings rife with a propensity toward sadness (“Crop”) and self-deprecation (“Things I’m Good At”; “I Went to the Doctor”). If you are new to her, Byrne is an Irish emigrant living in Providence, RI, and teaching at RISD (below: her faculty profile video). 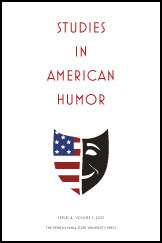 Special issue on contemporary satire for Studies in American Humor (Fall 2016), James E. Caron(University of Hawaii—Manoa), Guest Editor; Judith Yaross Lee (Ohio University, Editor). In response to the torrent of satiric materials that has been and continues to be produced in recent years, Studies in American Humor invites proposals for 20-page essays using the rubric of “the postmodern condition” as an analytical gambit for demarcating a poetics of American comic art forms that use ridicule to enable critique and promote the possibility of social change. Proposals might focus on aspects of the following issues. What problems are associated with defining satire as a comic mode, and how do recent examples fit into such debates? How useful is the term postmodern to characterize satire—i.e. does it refer to a period or an operation? How useful for understanding recent and contemporary satire are terms designed to indicate we have moved into something other than postmodernism: e.g. trans- or post-humanism, cosmodernism, digimodernism, post-theory? 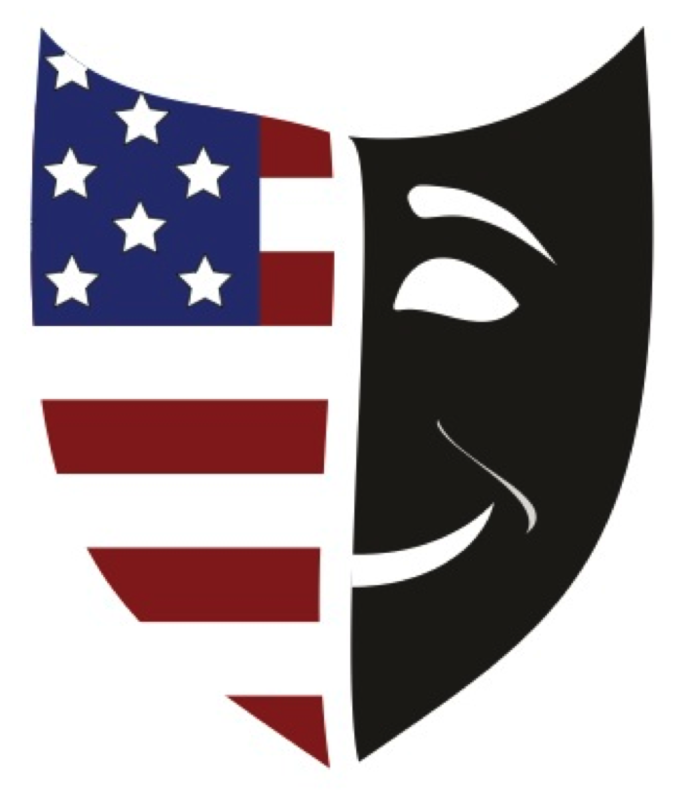 In accounts of satire as a mode of comic presentation of social issues, what differences arise from varied technologies andplatforms, not just print but also TV sitcoms (live-action or animated), movies, comic strips, stand-up formats, or the sit-down presentation of Jon Stewart and Stephen Colbert? Do significant differences emerge from satires on YouTube (or the video-sharing service, Vines) and various Internet sites (e.g., Funny or Die) and social media? If ridicule, broadly speaking, is the engine of satiric critique, what ethical concerns are entailed in its use? Various disciplinary perspectives and methods are welcome. StAH values new transnational and interdisciplinary approaches as well as traditional critical and historical humanities scholarship. Submit proposals of 500-750 words to StAH’s editorial portal <http://www.editorialmanager.com/sah/> by June 15, 2015, for full consideration. Authors will be notified of the editors’ decisions in early July. Completed essays will be due by January 15, 2016. For complete information on Studies in American Humor and full submission guidelines see <http://studiesinamericanhumor.org/ >. At the time of publication all authors are expected to be members of the American Humor Studies Association, which began publishing StAH (now produced in association with the Penn State University Press) in 1974. 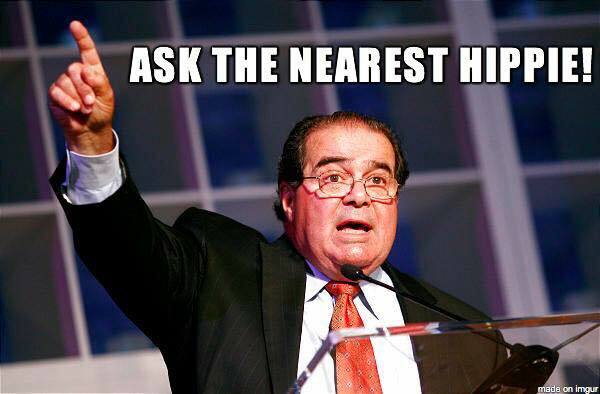 Queries may be addressed to the editors at <studiesinamericanhumor@ohio.edu>.